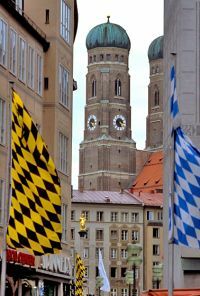 �Munich nestles between art and beer like a village between hills.� Originally written by Heinrich Heine some 150 years ago, these words remain true today. With the opera and Oktoberfest, Pinakothek art galleries and Hofbr�uhaus beer hall, Bayern Munich and BMW, the city manages to marry vibrant modern life with old Bavarian tradition. It really is a dream city come true. With its famous onion domes, the 15th century Gothic Church of Our Lady is Munich�s unmistakable landmark. Not far away, at Marienplatz, the carillon plays three times a day. And just a stone�s throw away is likely the most famous tavern in the world, the Hofbr�uhaus beer hall. Other sightseeing highlights include the Olympic center where the Olympic Games took place in 1972. Regarding museums, the Pinakothek der Moderne presents modern and contemporary painting and sculpture, jewelry, graphic art and the collection of the architectural museum under one roof. Together with the Alte Pinakothek, the Neue Pinakothek, the Glyptothek museum of Greek and Roman sculptures, the antiquities collection and Lenbach House, it forms a unique arts collection. The German Museum with its branches Verkehrszentrum (transport center) and Flugwerft (aircraft works) is a pioneering museum all about mobility. The university campus can be easily reached by public transport, see details on how to get there. Registration hours are listed here. The main entrance for all conference attendees is �Nordtor� in the north of the campus in front of building 36. All conference attendees arriving by car enter through �Westtor�. 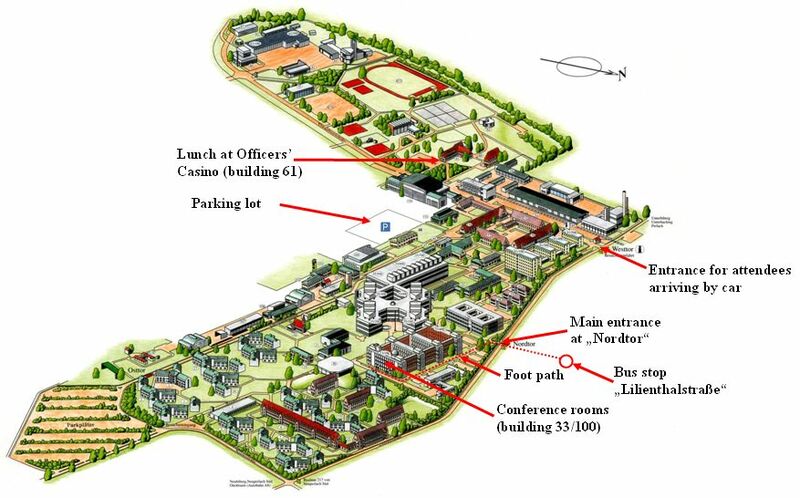 A map of the University campus with the important locations for the conference marked is linked above. All keynotes will take place in the main lecture hall ("Audimax"), room number 0161. The registration desk and the exhibition space for sponsors and posters is located in the foyer. Refreshments during morning and afternoon sessions are served in the foyer as well. 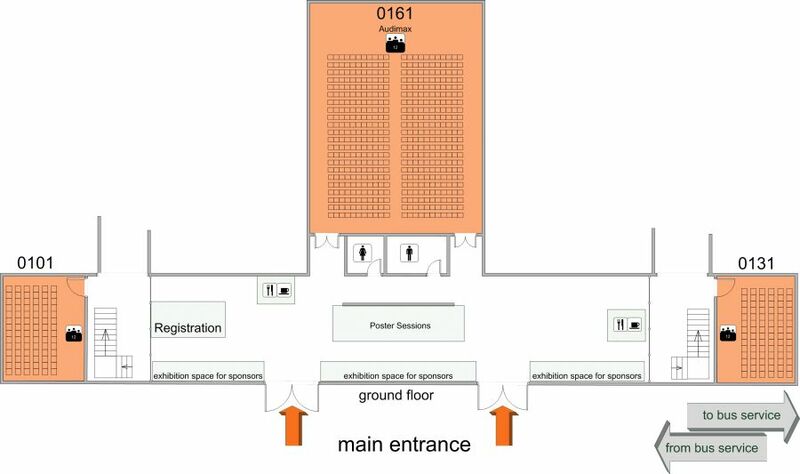 For a pdf file with a map showing all floors of the conference building, please click link above. All conference attendees are cordially invited to enjoy an evening with colleagues and friends. Be our guest for a selection of hors d'oeuvres and drinks. 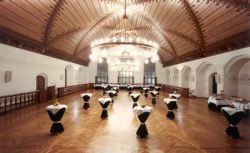 We will be hosted by Munich's Mayor Christian Ude at the Historical Ballroom in the Old City Hall on Marienplatz, see location on the city map. You can reach it with the metro line U3 and U6 and every S-Bahn line, stop "Marienplatz". From the university campus, take the bus to "Neuperlach S�d", then the U5 and change to U3 or U6 on "Odeonsplatz", exit the next stop "Marienplatz". If you already checked in for the conference, please bring your badge to get access. If you did not yet register on-site you will get your badge and public transport ticket at the Welcome Reception. 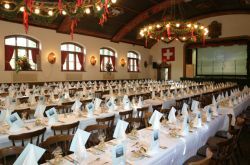 The banquet dinner will be held in a traditional bavarian setting at the Augustinerkeller in the Munich city center: For more than a century and a half the Augustiner Keller Hall has ranked among the most popular oases for beer lovers in the Bavarian capital. It was first mentioned as a warehouse of beer at the Munich city map of 1812. But it belonged to the B�chl Brewery as far back as the 17th century. And so municipal records referred to it as �B�chlbr�ukeller� (B�chl Beer Hall) until Georg Knorr bought it in 1842. Knorr was the son of a court clerk from Dachau. In the 1830s he advanced his position through a beneficial marriage from bookkeeper of a Munich merchant house to become its owner. In 1838 Knorr became co-founder of the Bayerische Hypotheken- und Wechselbank, one of the banks which created today�s HypoVereinsbank. One of Knorr�s sons purchased the �Latest News� (Knorr & Hirth Publishing House) in 1862. In 1848 the energetic businessman rented the facility, which was then known as �Knorrkeller�, to Gabriel Sedlmayr. The municipal directory of 1842 classifies the beer garden as one of the most beautiful in Munich and comments: �Although it is situated right across from the site where the city of Munich discharges its sentences of capital punishment, it is frequented by numerous guests.� In 1862 the hall was acquired by the owner of the Augustiner Brewery, Joseph Wagner. At the time the fenced square only had a few trees near the horseshoe-shaped hall. Wagner is to be thanked for having more trees planted. The history of Augustiner Braeu, due to about 670 years of tradition Munich's oldest brewery, has begun in the year 1294, as the cornerstone of the Augustinian Monastery was laid on the Haberfeld (Field of Haber) at the Neuhauser Gasse (Lane to Neuhaus). It is documentary acknowledged that already in the year 1328 a brewery existed within the monastery and an excellent beer was brewed there. Therefore 1328 is considered as the foundation year of the Augustiner brewery, which is thereby the oldest of all existing breweries resident in Munich. Beer brewed according to the Bavarian "Reinheitsgebot" (purity law) has a long tradition with Augustiner Braeu, nowadays they offer 8 different types. As always the so-called �Edelstoff� is served from the wooden oak. Connoisseurs proclaim it to be the best of beers. Starting at the university campus take the bus to the metro stop "Neuperlach S�d", then go with U5 to "Karlsplatz (Stachus)" and change to any line of the S-Bahn (suburban train) in the direction of "Hauptbahnhof / Laim". Exit at the stop "Hackerbr�cke", then turn north, make a right on Arnulfstra�e, the location is at approx. 200m on the left-hand side. Please bring your badge to get access.